As winter has set in, I started using the heater and fan in Wooly, to be met with rattles . At first I thought something was wrong with the engine, but soon realised that it was the heater fan. Probably needs oil in the bearings. So out with the motor, only to find that there is a lot of slop in the business end bearing, the one you can’t normally get to, because it is buried inside the heater. Oh well; dismantle the motor to find out what’s wrong. 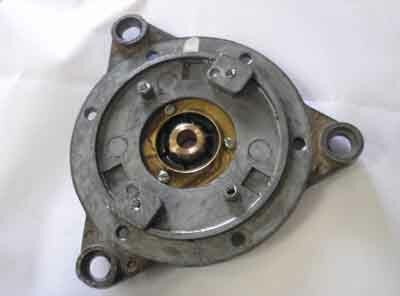 Turns out that the bronze bearing is worn. To get at the bearing I had to drill out the rivets holding the brush plate, after marking its orientation. Also had to drill out the rivets holding the bearing .Then off to my favourite bearing supply shop, to see if they have replacements. 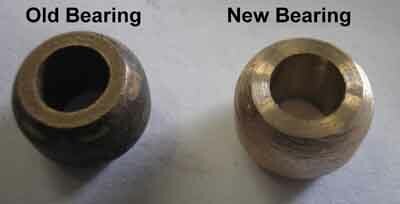 They didn’t, but did sell me some sintered bronze bearing stock, so I could make my own. When I started to measure up for the sizing of the new bearing I was going to make, I found another problem, the motor shaft was worn, as well. This threw a bit of a spanner into the works, as a new bearing would still be sloppy, after installing it. Time to do something about the shaft. 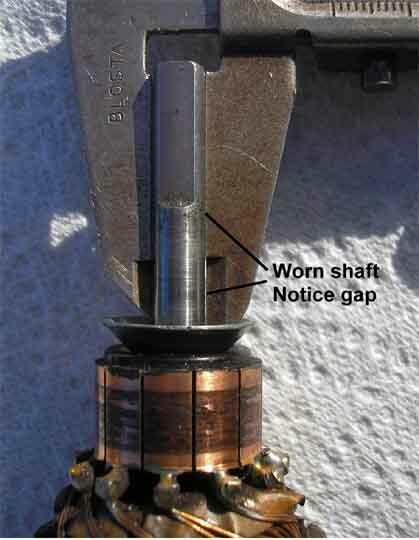 I carefully spun it in the lathe and with emery cloth slowly "sanded" the shaft down till it was parallel, again, being very careful to not touch the actual bearing surface. Now to make the new bearing. First drill an undersize hole and then, using a modified hex key, as a boring tool, open the hole up, until the motor shaft is a snug sliding fit. 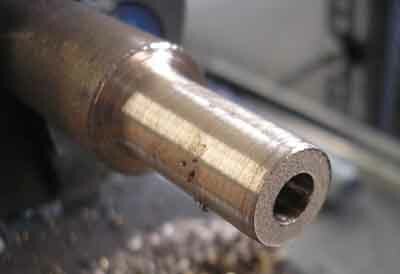 Next turn down and shape the outside, to the final bearing shape. It only took me two goes to get this right. Time to put everything back together, with plenty of oil in the felt wicks. Because I had drilled out the rivets, I used small screws and nuts to hold the bearing assembly, and drilled and tapped the end casting for 1/8" screws, to hold the brush plate, checking to make sure that these screws didn’t foul any electrical part. Next reassemble the whole motor, fit it back into the heater box, and try out. Fantastic, can’t hear a thing. This created another problem; how was I to know if the fan were on or not? I solved this by fitting a small bezel light, wired to the switch.